Click Table from the Create group on the Home tab of the Ribbon if necessary (you’ll be here by default after creating a new web app). Type a keyword in the search box that represents the type of data to go into your table. 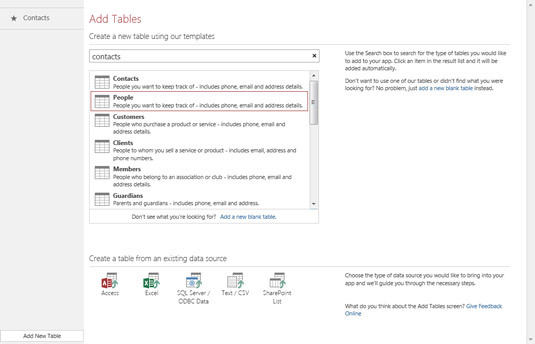 For example, type contacts for contact-related tables or order for customer- and order-related tables. Access displays a list of related tables. Access finds tables related to the keyword contacts. Access creates the table. The table name appears down the left side of the screen. Access web apps do not support the OLE Object, and Attachment data types that that Access desktop databases support.